This is a brilliant advert because of its catchy tune and the fact that it stars the famous Ross Kemp (Grant Mitchel) of East Enders fame. Definitely a classic! 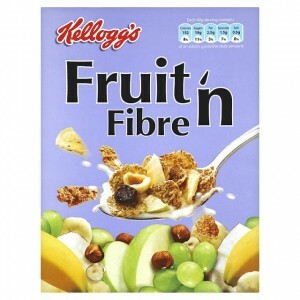 Fruit ‘n Fibre is a breakfast cereal produced by Kellogg’s and sold in various countries (including the UK). It consists of wheat flakes, dried fruit(sultanas, raisins, coconut, banana, and apple) and hazelnuts. Versions of this cereal are also produced by other companies under similar names, such as Fruit & Fibre. The Kellogg’s version is also known as Optima Fruit & Fibre in some markets (this name was used in the UK for a short period from 1997, but was eventually changed back).